WP DB Migrate Pro – A Discount and a Giveaway! Brad Touesnard is the guy that’s behind several popular WordPress plugins one of which is the WP App Store, the other being WP DB Migrate Pro. To say that he’s an accomplished and respected WordPress developer would be somewhat of an understatement. He’s recently released the lastest version of WP DB Migrate Pro which I had the pleasure of participating in the beta test. Generally speaking, this is the easiest plugin for migrating WordPress databases from local servers to remote servers and back again. Features aside, Brad’s been kind enough to support a giveaway and a coupon code specifically for you guys. In short, WP DB Migrate Pro makes it easy to import or export your database to and/or from a remote server. Brad’s also offering killer customer support for those of you who need it (though I think the plugin is one of those that’s that easy to use). Easy, right? So let’s get down to the giveaway and the coupon code. For those of you who don’t win the giveaway or can’t wait to purchase the plugin, use the coupon code MCFARLIN20 to get a 20% discount on the plugin through May 22nd. Thanks to Brad for the plugin and for offering you guys a free copy and a coupon to the plugin. If you chat with him on Twitter, be sure to pass him a note of thanks :). The plugin’s killer – best of luck to you guys. This would be useful for my development because, despite automating most everything else, I still do migrations by hand. I’d love to try this out with wp-cli and see if I can automate my daily activity with an easy push and pull. This would make the process of moving from development server to live environments so much easier and I’ve heard rave things about the plugin, so I’m excited at the prospect of using it. This would definitely help with the process of migrating locally developed sites to the live server. Why haven’t I found this plugin before? Looks great! I convert lots of static sites to WP, and I develop them first on a dev server of my own, before moving them to a client’s server. I have a fairly solid process down for making the move, but it would be easier to do with a good tool like this one. As a Java dev who is really trying to dig into the world of coding with WordPress, I am constantly on the lookout for tools to make life easier. This would certainly help in the process of managing my development vs. production environments in an area that can be a pain to do manually. Funny you post this now as I am working on restarting a new project that I am looking to use as my platform over at http://www.hazardmanual.com. In getting my production up to speed I had to mess around with pulling the prod db down to my dev environment (MAMP PRO) and I was thinking there has to be an easier way. This would help me tremendously in migrating a WooCommerce site I’m working on currently with a ton of products. I’m developing it on my own server right now but will need to move it to the client’s server very soon. Quickly and easily migrate WordPress data? Heck yeah! Clients always find new ways to break a theme or a plugin. Having WP DB Migrate would ensure I am always using their latest and craziest scenarios. And a sincere thanks to Brad Touesnard for taking the time to develop a much needed plugin. Well done! I’ve heard great things about this plugin and would love to give it a go. I manage multiple client sites and being able to move them quickly to a new server would be fantastic. Would this plugin be recommended for migrating from one hosting provider to another? Definitely – it allows you to pull information from your current host, perform a database backup, then upload the contents of the database to the new server. If you have to replace certain strings, it allows for that, too. I’ve recently started my WordPress development business and WP DB Migrate Pro would be an awesome way for me to speed up moving all the sites from dev to production. Thanks for running the giveaway, Tom! This sounds like a great product. I’ll use it to backup live sites and move sites from local to production. I’ll need to check out the free version, but it sounds like the pro version is worth it. This will save me countless headaches migrating/syncing between dev, staging, and production servers. It might also solve world hunger! I use this plugin on virtually every WordPress installation. It makes migrating from development to staging and from staging to live a single button click. This is a great plugin. I’ve tried it out by purchasing the single site license and it works great! I’d love to have a developer license so I could use it on all of my sites! This is an excellent product for my workflow – building sites on my local server I can FTP files and then push the database to the remote server, with all the appropriate urls changed as it migrates. Then before making any adjustments per client requests, pull down the database from the remote server, make the changes locally, testing the changes against the latest data. Pushing it back once done. If I had the luxury of a staging server, then it would be even more fun! I eagerly awaited this plugin because Migrate WP DB has been such a key part of my daily workflow. This new pro plugin takes it up a notch and gives me the tools I need to deal with excessively large tables and speeds migration between remote servers. It’s takes mundane tasks and makes them super quick. Been using it since day 1, awesome time saver! Well actually I already use this plugin, and it’s made my life so much easier. I highly recommend it. Let’s cal it indispensable. WP DB Migrate Pro is another very important piece in that intricate version control puzzle. Finally! no more manually replicating my local development onto a live server. I’ve been getting sick of doing twice the work. This plugin is definitely worth the cost if you think about how much time it will save you. I’ve been tirelessly looking for a reliable push pull solution to use in git deployments. It’d be super nice if I can git deploy and push pull the database with this plugin! I would be interested in reviewing WP DB Migrate Pro and testing whether it might be suitable for those low-resource hosting situations where a client wants to escape from crappy hosting but cannot use the usual backup plugins. I started drooling over this plugin as soon as I read the description. It was still development as I prepared to make my very first WordPress site live, so I had to go ahead and do things the hard way. I can hardly wait to do it the EASY way with Migrate DB Pro! I love this plugin because it saves me precious time by making my development work flow more efficient. One of the few plugins that has a high ROI (return-on-investment), which is why I have recommended it to my colleagues and friends. I frequently work on websites for clients. But in order to protect their live site during my development, I try to copy their site to my computer and run a local copy for development. Migrate WP DB would help me not only do this for local sites, but also for subdomain beta sites with clients. The back-and-forth syncing is beautiful! This plugin looks like the perfect solution to creating a streamlined development and updating process. Too often I find myself editing live sites just to save time. This tool would definitely help me convert to versioning. This would absolutely make life easier as a serial WordPress developer. I’m going to switch hosts on several sites soon and this app would let me switch in half the time. I’ve used the free version for years, and already bought a Developer license for Twig. It’s a great plugin for managing site migrations (mainly the way it handles serialized data for different-length domains). It’s an essential part of any WP set up – if, in the future, it is extended to integrate with rsync for handling the files as well as the database, it would truly be the killer WP app. This plugin surely speeds up the development process for our websites. I makes the process of synchronizing the databases super fast and easy. I’ve been developing for WordPress for quite some time. Despite having an automated workflow in most regards, WordPress deployment and migration has always remained a pain. For the last year I’ve been using the free version of WP DB Migrate, but having to fire up phpMyAdmin or SSH to complete the migrations is a pain if you’re making a number of migrations per day on a variety of sites and servers. The pro version does away with that. Since purchasing a development license a few weeks ago I’ve been putting WP DB Migrate Pro through its paces. I can honestly say its well worth the cost. After geting it setup (a 5min operation per site) its literally just a single click to perform a migration from start to finish. I’ve used it on different client sites of varying sizes and server configurations and its worked flawlessly. So yeah, I dig it and am glad to support the developers. Finally an essential time-saving tool for WordPress developers! The biggest hurdle when moving back and forth between a test server and a production server is the database. WP DB migrate pro makes this fast and *super* easy, taking care of search and replace and serialized data. I’ve been using the free version for some time and it’s the only database backup I rely on – especially when moving between test and other servers. Looking forward to using the pro version to automate the testing and production process. I have had my eye on this pro-version plugin. Thank you! We have fallen in love with the current version and quickly added it to our required install list for each site we build. It has made the frequent updates to even very large installs very quick and painless. All largest migration to date has been over 40,000 posts and 1GB of images! Worked flawlessly moving an active domain to a new server when all others we tried failed. There are some workarounds for MultiSite and blogs installed in subfolders. Can’t wait to get the new version guys! I recently purchased the plugin and it’s pretty amazing indeed! To try it out, I got the business license which is good for a maximum 6 sites (4 sites if you have 3 environments, like local, staging, production). What I especially like is that I can push my local database to my sandbox and on to my live environment with basically the ease of a click. Nice one, already using the plugin for quick db updates between local and staging server and can recommend it. My Modus Operandi is to develop WordPress (WP) websites locally on my PC. After they are sufficiently developed, I transfer them to my clients hosting server. 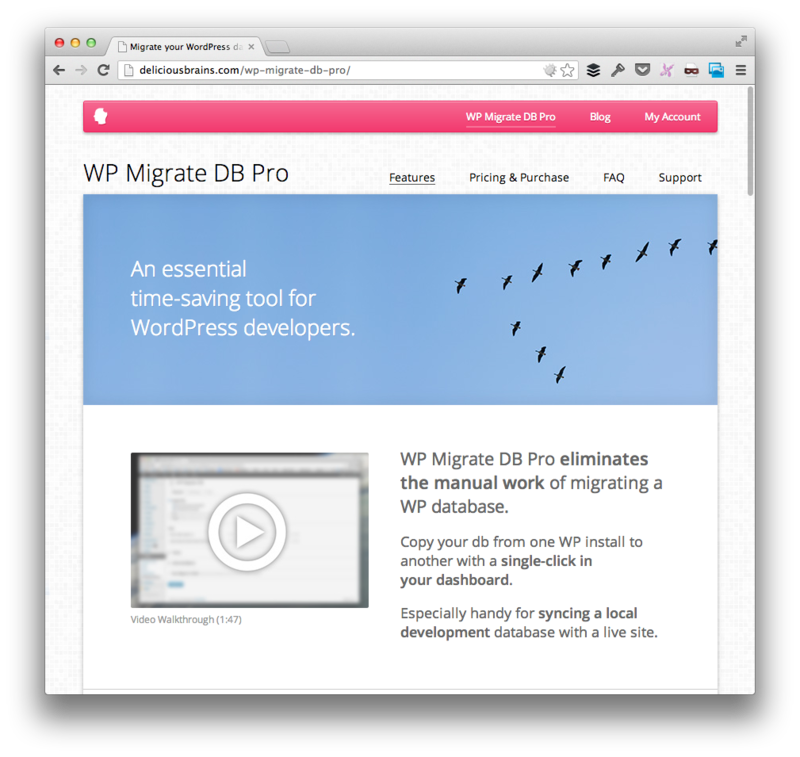 The WP DB Pro plugin will save me loads of time with my freelance WP development. Thanks for this great Giveaway. Having to switch between local and live sites on a regular basis, this plugin would make it super easy. I’ve been waiting for something like this for quite some time. Your regular version has helped me countless times so i’m looking forward to trying the pro version. Migrating the database between domains or dev-live-dev has always been a pain point with WordPress. Anything to make development easier! This plugin’s a boon for making the DB component of any local->staging->production workflow simpler. Was previously using a standalone php script to handle the s&r component of this procedure, but handling the s&r and the db export in one tool is hugely convenient. Thanks! I’ve been in a deep search the past few months for a reliable and simple way to migrate my WP Database and Files. This is promising. I hope to experiment with it more soon. I love the ease of deployment that comes with this awesome plugin!! This plugin saves so much time in moving databases from local, dev, staging and production environments. It takes an an otherwise tedious process and makes it easy. Thanks for creating this! As a WordPress theme developer, making my living by making WordPress sites, I have to migrate the database from my computer to either a test or live environment, so I have to do at least one migration per site. Since I ever started migrating the WordPress Databases on my own, that involved a bunch of MySQL queries, which in general did the job pretty well, except for occasionally breaking a couple or all of the widgets. Its better than the free version, allows developers access to the production DB without having admin access, and the support team is very responsive. I love working on my local machine, whether it’s developing my own WordPress plugins, or working on the theme for a live site. However, whenever I’m tweaking the design of a site, or redesigning it completely, it helps to have an up-to-date version of the content available, so I can see just how the live site would look. Currently, I need to create export files with phpMyAdmin and then import them into the other site, and then replace all instances of the old site URL with the new one using the serialized search-and-replace tool. I can definitely see how this tedious process could be made a whole lot easier using this plugin. Sometimes I just don’t bother working in anything except the theme locally, and doing all other adjustments on the live site. Thanks for the giveaway! Congrats to Sunny on winning the giveaway today! If you haven’t bought yourself a license, you still have six days get 20% off using coupon code MCFARLIN20. Just a reminder, today is the last day to get 20% off with coupon code MCFARLIN20. Check out this set of podcasts and you should be good to go – I talk about exactly that over the course of the four episodes. It is – definitely one of my most recommended plugins. Brad’s done a great job with it!